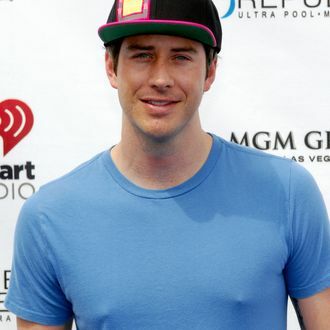 Sure the 22nd season of the Bachelor might have come to an end with Arie Luyendyk Jr. engaged to Lauren B. and Becca K. off to be the next Bachelorette, but some people are still pissed about how that happily-ever-after came to be. One such person is Becca’s local Minnesota state representative, Drew Christensen. After watching his constituent win The Bachelor only to then be dumped by her new fiancé on national television, Christensen offered to introduce legislation banning the race-car driver from their state — in exchange for a thousand retweets. Needless to say he got the social-media seal of approval. The state of Minnesota hereby adopts a policy of zero tolerance of Arie Luyendyk Jr. from season 22 of The Bachelor. It is state policy that every person in the state has a right to live free from the presence of Arie Luyendyk Jr. in the state. Christensen isn’t the only one in the North Star State hating on Arie. There are also 12 billboards in Minnesota shaming the reality star for his behavior, and other billboards in Los Angeles and New York. It doesn’t seem like Arie’s explanations are doing him any favors.